The VeloBind System Three Pro has maximum productivity and has the best punch and bind for mid to high volume users. This system binds up to 3” (usually 750 sheets of paper) think documents in only seconds! The VeloBind System was manufactured by the GBC company, known for their innovative designs to make binding easy. The audio timer beeps to indicate when the binding process is complete, and the time is adjustable for faster a turnaround on smaller presentations. This machine is so versatile you have the choice of which operation to use. It also includes a push button, punch sensor, or foot-pedal control for convenience. Another great feature of the System Three Binding Machine is its built-in de-binding function that lets you revise sheets without the manual de-binder, which has a tendency to be tough on the operator. The ready light indicates when the binding is complete and the extra-large drawer for paper waste and pin debris lets you empty the waste bin less frequently, leaving more time for binding and less time taking out the trash. With the adjustable paper alignment guide, you can center your holes on you sheets up to 14″ legal size documents. The pressure bar firmly holds sheets for a compressed, professional bind and automatically raises when the binding is complete, releasing your book. The bind speed indicator adjusts the binding speed based on the document thickness and the integrated de-bind feature lets you add or delete pages effortlessly after the document is bound. With the VeloBind System, your book will be firmly and professionally bound in just seconds. This machine is very easy to use, all you have to do is place your sheets in the machine and use your choice of operation. VeloBind offers a “permanent” bind that is used primarily in the legal industry because of its tamper-proof capabilities and it provides a flat spine for easy storage, transportation, and mailing. The most popular applications with the VeloBind include: legal documents, reports, manuals, proposals, and presentations. If you have any questions or are interested in purchasing a System Three Pro , visit us at SpiralBinding.com. 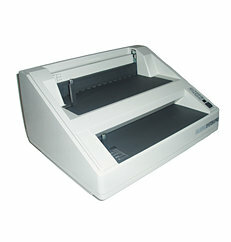 We have great pricing on a full line of VeloBind Quick Binding Machines. Call us at 1-800-631-3572 for more information!